When Cole Guttman boarded his flight at LAX last month en route to Michigan to compete in a Tier I Elite League showcase, he routinely figured he’d return to L.A. with his teammates at its conclusion. The U.S. National Development Program (NTDP), however, had other plans for the Los Angeles Jr. Kings’ 16U Major AAA standout. During the event, Guttman and his family were approached by Ryan Hardy – the NTDP’s director of player personnel – who invited the nifty 1999-born forward to join its Under-17 Team for a stint of games against United States Hockey League (USHL) competition. “Of course I said, ‘I’d love to,’” said Guttman. The Northridge native dressed in three games for the NTDP: one at the program’s Plymouth, Mich.-based home against the Muskegon Lumberjacks, and two on the road against the Dubuque Fighting Saints – the USHL team that owns Guttman’s draft rights. Representing his country for the first time held added meaning. Guttman’s recognition by the NTDP comes as little surprise. A two-time USA Hockey Select Festival participant, he was tied for second in Elite League scoring in the 16U division with 37 points (18 goals) through 24 games at the time of his invite to the esteemed program, which has developed countless NCAA Division I and NHL players since its inception 20 years ago. 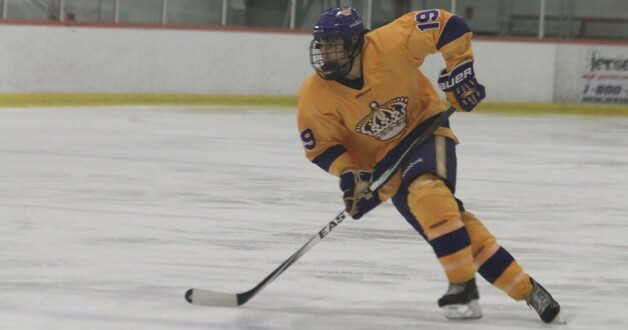 “It was a huge opportunity for him,” said Jr. Kings 16U AAA Major head coach Jack Bowkus, who compares Guttman’s style of play to that of dynamic Calgary Flames phenom Johnny Gaudreau. “His speed and his knowledge really set him apart. He’s got really good hands, good patience and a true nose for the net, too. The 5-foot-10, 165-pound Guttman, a member of the LA Selects’ team that won the Elite AAA division championship at the Quebec International Pee Wee Tournament in 2012, says continuing to make strides, physically, is paramount as he pushes towards the next level. “Over the summer, I worked a lot on my leg strength to improve my speed and my overall strength,” said Guttman, who also won a Pee Wee AA national championship with the California Heat in 2011 under the guidance of assistant coach Robbert McDonald – now an assistant with the Jr. Kings’ 16U AAA Majors. Guttman, who will head to Dubuque in the coming weeks to play a handful of games and participate in practices before returning to L.A. for the Pacific District regional championship tournament, is quick to credit Bowkus and Shawn Pitcher, the head coach of the Jr. Kings’ Bantam AAA 01 team this season who mentored Guttman with both the Selects and Jr. Kings, for their influence on his development. And while the Portland Winterhawks own Guttman’s Western Hockey League rights, his sights are set on earning a NCAA opportunity in the years to come. “That’s the plan right now – to hopefully play in the USHL next year and pursue college a couple years from now,” he said. “He’d be an exciting college player,” Bowkus added.